As I explained earlier, our basic idea was to go to people, to different languages and to the young poetic minds. 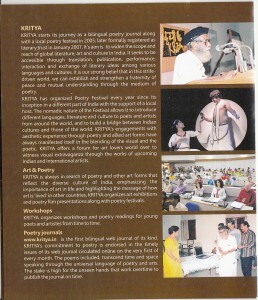 As there was no poetry festival in India until 2005, we decided to go to different language groups. So After the first international poetry festival in Kerala in 2007, we went to Punjab in 2008, Then next year we have gone to Mysore, and then to Nagpur in 2011. The Nagpur experience was so bitter that I feel like coming back to Kerala, The 2012 festival was so good, but in spite of my all efforts, the college students were not sent to the festival by college teachers. So we decided to go to universities and colleges to interact with young minds. That is how in 2013, we have gone to Wardha Antararashtriya University. I started feeling that my style of work is very different than common work culture in our country. We talk more, but work less. We Indian believe in Jugadh. And the young generation is more interested in taking shortcuts. This was the time, I got interested in poetry therapy, I also felt that poetry is for the life and for the people we write for. Mostly we don’t read the poetry to people, who need it. In 2016, we planned to go to different places with poetry, like colleges for the students, Asan Smarakam for the villagers, and hospital for the patients, and to the beach among the venders. We discussed the aim of poetry and the importance of languages in the poetry with young poets, who write now in English only. Thought the idea of importance of mother language could not reach to young one immediately, still we could saw a few seeds in their mind. This festival was small, but I had a bit satisfaction..
We planned well for the kritya2017, so that we can go to different people, who can be benefited by poetry. this time our international team was real big – as we had 24 international poets along with many Indian poets. International poets were from various counties like Turkey, Estonia, Spain, France, Germany, Netherland and Switzerland to name a few. The main aim to organize this festival was to plant a seed of thought in people especially among the young generation and use the poetry as therapy. Keeping this vision in mind we reached out to all sections of society where our poets performed at different venues such as State Central Library, University College, S N College, Chempazhanthy and Bharat Bhavan along with the students of a prominent college of Kerala. The most important session was to with poetry within the prison for prison inmates of Poojapura Prison Cell, Thiruvananthapuram as a part of poetic therapy, Poetry for Freedom of Soul. There will also be the screening of short international poetry films at Bharat Bhavan in the evening followed by poem recitation by South African and German poets. The poets had opportunity to pay their tributes to the renowned Malayalam poet Mahakavi Kumaran Asan by visiting his birth place Kayikkara , and meeting the villagers, who are also were very interested in poetry. At the end, there will also be an interaction of poets with children of orphanage called –Sai Gramam where poetry was used as a therapy to heal and gave children a different experience. This was the most satisfactory experience for all of us, as we could first time feel the power of poetry while reading for the prisoners, while telling them that most important is to have freedom in soul, and also while communicating to orphaned children. It was also wonderful experience when we meet inmates of orphanage, who could mingle with poets without worrying about the difference of languages and we all got so emotional when one 90 years old man in old age home talked about his poetic journey. 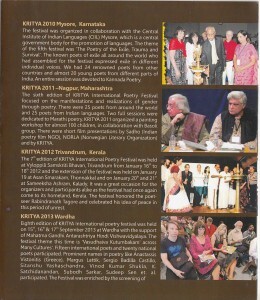 Our 11 years journey has proved that Kritya is not crowd oriented festival like many other lit festivals in India. We communicate with all art forms, through poetry. For us poetry is spirituality without any religion. In modern time, when there are 336 literary festivals in India, which are attracting elite class. But none of them are communicating to poor people, villagers, farmers, orphans and prisoners. How many go to hospitals to communicate with patients. I feel that Kritya should not become the part of such crowd festivity. That is the reason; we at Kritya are changing our path and are involving many youngsters who take Kritya to the people, who need poetry as life line in any place of the world, we can say, now Kritya is going to be real international, and go to different part of the world from war places to classrooms and mentally disturbed. It could be any country or any place or even any war place. kritya’s story is very interesting, I was working for the fellowship on the subject- the Seeds of mind, a fresh approach to Atharvedic study, Dr Panikker was discussing the topic in between as usual. when I told him that most of the hymns of Atharvaveda , which were earlier considered as black magic, have a bit of philosophy or social culture history, He was agree at this point that most of the literature changes the meaning in such a big span of time, and due to socio-culture changes in the society. a word kritya was haunting me again and again, as the kritya word is used in Atharvaveda as some kind of verbal spell, as people pry to dieties to save from kritya dushanam. ( the sin or affect of kritya) My question was – in this case a world power was called kritya, and it was used to destroyed enemy. I was amused to see that how the power of word or shabda shakti was understood at that time. here I decided to take name kritya for my future ( at that time ) project – the journal of poetry…. When did I devolve love for poetry? I don’t think I loved poetry much as a student. Even in the college while reading Kalidas, Bhavbhoti etc,I could not develop the passion. Now I feel that was due to bad teaching of the poetry. Our poetry teachers explained the poetry, in place of let us getting in to the layers of the poetry. JMy whole passion was with stage performances, like debate, Elocutions, and Dramas,I starting in Hindi than in Sanskrit. I don’t know how I used to lean big duologue with ease. And I always enjoyed the stage. I started this journey of stage performance at the age of 11 as debater. In upper schooling I was more on the stage than my classroom. In colleges, ( I was moving from one city to another because of y fathers job) early college time only I was away from stage, that is because I think that college did not have any culture programme of good slandered . once I return to my own city Jaipur, I was again busy in the debates, but this time Sanskrit debates, alas,,,, no theatre. In university I was doing lead roles in Sanskrit theatre. Oh yes, I was writing also, but did not knows what was that . Once I showed my writing to our teacher- Hariram Acharya ji, and he declare it poetry. Suddenly world became upside down for me… an era of my life started, here there was no space of words from books; the whole knowledge was travelling around the things, which were not never known to me. There was a new language, a new family, a new thinking and a new society. Here I learnt that gossiping is a social entertainment, the jokes can be red, blue and green, and so many new things. Oh God, this is a tough acting, I thought. In this stage, you leave your own self; you are not acting as an artist, but as a monaster. Because when you act a role as an artist, you are honest to your self and the person, whom you are presenting on the stage, but here every thing is artificial. I went back to re-education, in the world of words, and in a time, my whole family was talking about literature, politics, social culture systems, in place of gossiping. Poetry came to me from my back door, and remains with me until today. Officially I took poetry only in my forties, and journey is always on, reading, writing, and talking to poets, taking part in poetry festivals, and so on. The Kritya is journey of poetry like me, and several others. 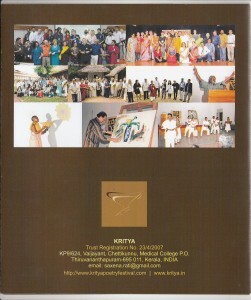 I have to plan for kritya almost 6 to 8 months ahead, the real planning starts with a promise of a base fund. This time, I got the idea of base fund in March April it self, from Raza Foundation. the first step is the selection of the poets. and a relevant theme. As base support is always sufficient for the local hospitality,The selection is not easy process, as i can select the poets, who have travel support from culture or private organizations of their countries. As good Poets around the world are not rich and it is difficult for them to buy tickets for them. This process continue for long, because so many times, I have to apply for them, and some times the process is long. Once the list is over, I try to apply for the culture grant, which is subject to availability, but with number of formalities, and some times i dont get any thing. I mostly don’t go to private parties, because, i dont want to convert Kritya in to Masala festival, some Rap, some media, some swami, some spice, and done…. I go to local govt also, but some how, as a poet, I cant bag … and Moseley my bag is empty. Than I leave every thing on poetry. actually the strength of kriitya fest is the good poetry, and good translations and the young people, who come at last to read translations. and some good hearted people who help us. I dont say that i don,t have any support, because i get some unexpected support, for eg, I have to write press note in Malayalam, and the written note, what i got was not good at all, Than Kayakarra secretary came to talk about the fest with his team, and i made them write the note,,, So I know very well , how to use others power..
Our basic idea for Kritya was to take the festival in different languages groups. Until 2005, there were a few literary festivals in India, so it was nice to go to different places, with the help of local host. After first international poetry festival in Kerala in 2007, we went to Punjab in 2008,. We used to take help of local host for hosting part; means stay food of the poets etc. Than next year we have gone to Mysore, and than to Nagpur. The Nagpur experience was so bitter that I feel like coming back to Kerala, and it was good also. The 2012 festival was so good, but spite of my all affords, the college students were not sent to the festival by college teachers. We have again gone to Wardha Antararashtriya University, so we can to go to the students. So, I decide to work from Kerala, and try to bring the audience to the poetry. The festival was success in 2014, but we could not develop the interest in young one. Young people used to come and take poets for the tour, the artist will come and start doing their business, and thus the aim of poetry festival lost. In 2016, I have plan to go to different places with poetry, like colleges, Asan Smarakam, and hospital, it was a small festival with very number of poets, but I had a bit satisfaction. This time we could reach to a number of people. Story after festival was different, as I was targeted by a conspiracy by three trustees. It was difficult for me, but by now I understood that Kritya can not be easy for me,.. during or after the festival, I am going to be targeted and bullied by so many so called well-wishers. I almost lost interest in Kritya, but than I got a basic support from Raza foundation, and I started my madness again. This time people started joining Kritya automatically, and now we will go to public library, colleges. To the birthplace of a great Malayalam poet, Kumarasan, to his workplace and also we will support to BOOK ON THE BEACH LITTERARY Festival but taking our poets to the fest. We will also visit prison and child care centres. We will have performances, Poetry films and Poetry theatre, along with live Painting. I know, the criticism, jealous and suffering is the art of any good work, so I have to make my self ready for it. 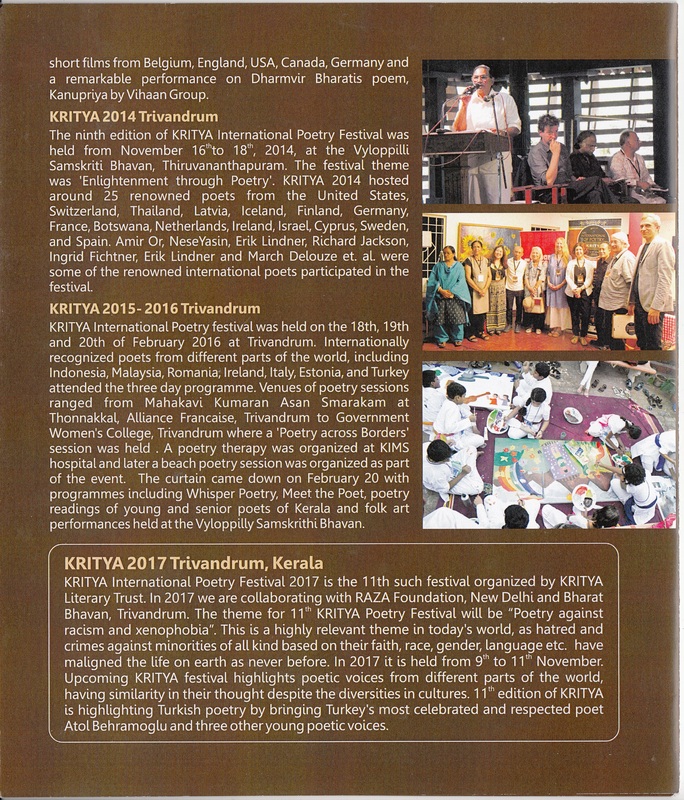 Kritya Literary Trust has been organizing poetry festival since 2005 in Thiruvananthapuram and are now coming with their 11th edition of ‘Kritya International Poetry Festival’ in collaboration with Bharat Bhavan, Thiruvananthapuram and Raza Foundation, New Delhi . The 11th edition of Kritya International Poetry Festival will be held from 9th November to 11th November 2017. The theme of the 11th edition of Kritya International Poetry festival is Poetry against Xenophobia and Racism. This theme has become more relevant in present times when all over the world there is an atmosphere of hatred and crime against all kinds of minorities such as gender, race religion, language, culture and so on. The festival will have two other full day programs on the previous day of the inauguration, 8th November and on the following day of valedictory function, 12th November. Kritya International Poetry Festival 2017 will witness the poetry recitation by 24 poets of from different countries like Turkey, Estonia, Spain, France, Germany, Netherland, Switzerland to name a few. The main aim to organize this festival is to plant a seed of thought in people especially among the young generation. 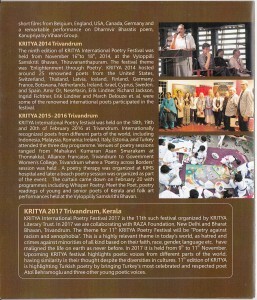 Keeping this vision in mind Kritya festival is a kind of moving festival where it will take the spirit of poetry amidst the people. The 11th edition of Kritya International Festival will be inaugurated on 9th November by Chief minister of Kerala Shri Pinarayi Vijayan . The meet will be presided over by Shri Ashok Vajpeyi, Poet, writer and Managing trustee of Raza foundation. The inauguration will be followed by paying a tribute to well known poet Shri O N V kurup via live painting along with recitation of his poems in five foreign languages by well known international poets. Live painting will be done by eminent artist and painter B D Dethan. To reach out to all sections of society our poets will be performing at different venues such as State Central Library, University College, S N College, Chempazhanthy and Bharat Bhavan on the same day in the afternoon. Under the guidance and leadership of Poet Prabha Verma and Madhusudan Nair there will be a session for prison inmates of Poojapura Prison Cell Thiruvananthapuram as a part of poetic therapy, Poetry for Freedom of Soul. There will also be the screening of short international poetry films at Bharat Bhavan in the evening followed by poem recitation by South African and German poets. On 10 of November 2017 poets will have a lively interactive session with young energetic students and lecturers of Mar Ivanios College. On the same evening the Book at the Beach Literary Festival at Kovalam will have the privilege of participation of international poets of Kritya International Poetry Festival where they will mesmerize book lovers with their poems and add colours to the book reading festival. On the morning of 11th November the poets will have the opportunity to pay their tributes to the renowned Malayalam poet Mahakavi Kumaran Asan by visiting his birth place Kayikkara , Maha kavi Kumaran Asan Smarakam and then to Mahakavi Kumaran Asan Memorial at Thonnakkal where there will be a poetry recitation by the poets. There will also be an interaction of poets with children of Sai Gramam where poetry will be used as a therapy to heal and give children a different experience. The valedictory function of 11th edition of kritya Poetry Festival will be held in Bharat Bhavan , Thiruvananthapuram, presided by minister of cultural affairs kerala Shri A k Balan as chief guest. 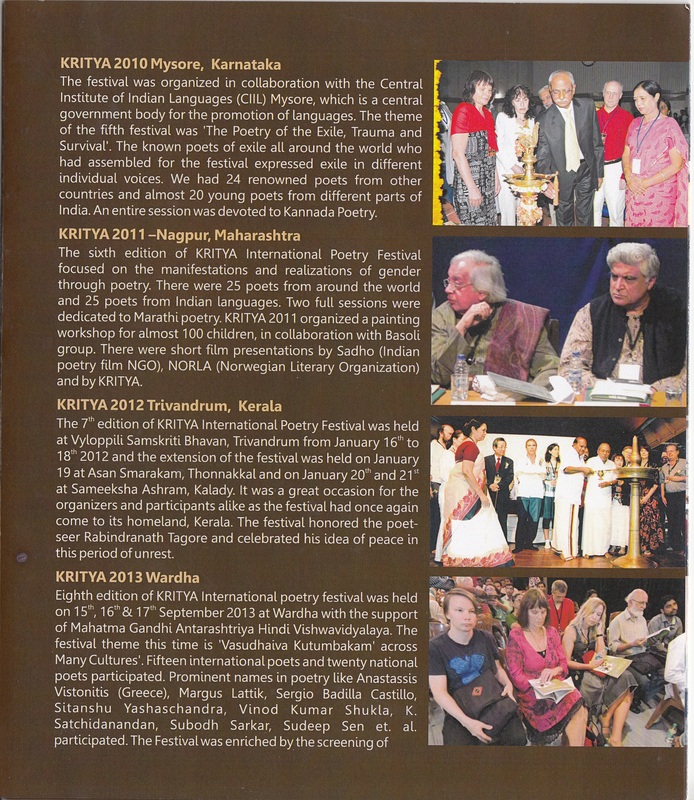 The Kritiya International Poetry Festival will also have two extensions program. one on the previous day of the inauguration that is 8th November and other on 12th November at Book at Beach literary Festival. On 8th November there will be a one and half hour long Poetic drama performance by Marc Delouze and his team who is a well known poet from France. On 12th of November four international poets will present their poems on the theme of the festival RESURGENCE OF HUMANIST POETRY AGAINST XENOPHOBIC TERRORISM at Mahakavi Kumaran Asan Smarakam, Kayikkara, and on the same day Doris Kareva from Estonia and Yolanda Castaño from Spain will participate in book reading festival at Book at Beach literary Festival at kovalam. 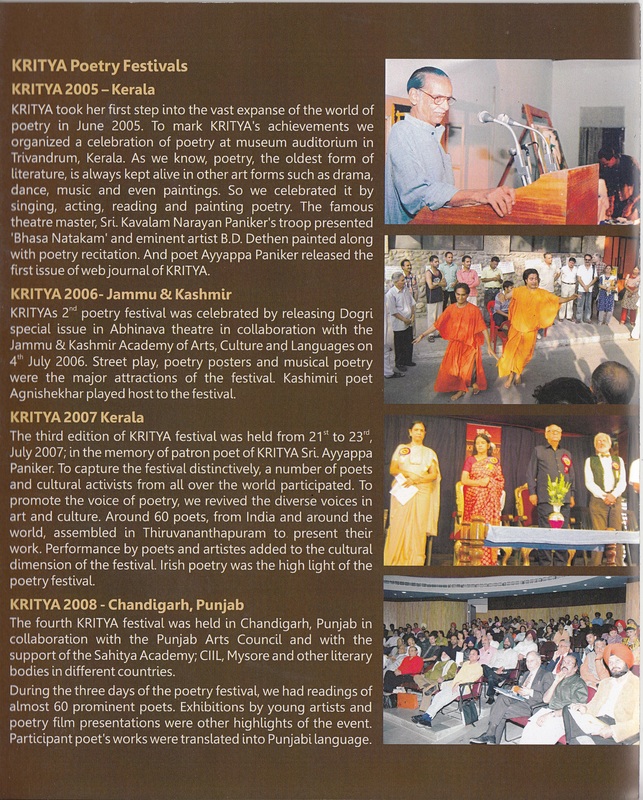 Kritya International Poetry Festival is a five day long festival which will see the participation of well known poets from different countries thus giving an opportunity to the poetry lovers of kerala to experience and enrich themselves in the company of international poets. 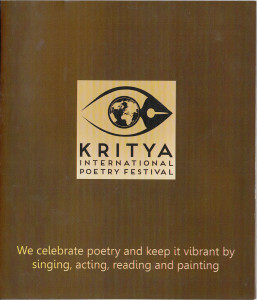 The team of Kritya International Poetry Festival cordially invites people of Thiruvananthapuram to be a part of it. Some times kritya got a fistful financial support, and some time, its bag was almost empty. I filled it time to time with my salary, or the Translation money etc. Kritya got a quite physical support like for editing, translation, etc. Translations was the area, kritya is grateful to translating poets, as it is an important work of kritya. kritya could never pay them in cash, but always appreciate their kindness. Some treated kritya like a goose, which can hatch golden eggs, and they try to destroy it …. some how, kritya it self is a power..
some left it as it was useless for them,, still kritya thanks them for the few steps they walked with us. First of all let me introduce my self. Kritya – the intense word power. Kritya – which always moves along with the ultimate truth. Kritya – which exists completely in accord with rightness. I reside in the hearts of people who raise their voice in protest against all lies, all wrong doings and all injustice. I appear before them in myriad forms, one of the most powerful media being poetry. Poetry – which was the noblest form of expression from time immemorial. Poetry – which today stands marginalized. Poetry – which flies on the wings of dreams. Poetry – which in the height of insanity walks bare footed on hard reality. Poetry – which is the voice of revolution. Poetry – which teaches us to love, to stand face to face with real life, to give up one’s existence for sake of the life. Poetry – which synchronises observations with pure emotions, which links the eyes to the heart. You can’t eat poetry. Rain goes right through it, and it doesn’t burn for long enough to really keep you warm. Poetry doesn’t provide a roof above your head, doesn’t give you a bed, bath or bread; it doesn’t save you from traffic jams, and you can’t smear it over your legs when you go to the beach. Poetry doesn’t occupy any hotel rooms. Poetry doesn’t fill restaurants, and neither does it help the growth of the middle class in the city centre. Poetry doesn’t care about the North/South divide, nor the one between East and West, and it can’t stop continental drift, the rise in sea levels or atmospheric pollution. In a school class of 30 children, only 0.2are touched by poetry. This translates to 1.3 children in an average residential area, and 12.4 in a city with a population of 200,000. Poetry barely touches urban illiteracy rates. It’s not on television, doesn’t influence viewing or listening figures, and doesn’t keep a single person from alcohol, drugs, smoking or a fatty diet. Poetry doesn’t ban wheely suitcases. It pays no role in collective bargaining, doesn’t urge stakeholders towards horizonal clustering or lure people to the polls. Poetry doesn’t attract major sponsors, it holdsno sway over public debate, and it doesn’t level out top salaries. Poetry doesn’t fill the gap left byawithdrawing government and is not armed against the flipsides of the digital revolution. Poetry doesn’t warn about gas leaks or excessively high levels of particulate matter;it doesn’t stop a single militant travelling to Syria or help you journey safely from Africa to Italy.Poetry doesn’t keep a single boat afloat, or an airplane in the sky, or a car on the road. Poetry is tough. Tricky. Eccentric. It is contrived language. A secret language used amongstfriends. Museum language. Barrier language. Opaque language. Anti-communication. Perverse language that bypasses all rules and conventions.Elitist language that reminds us of the limits of our brains, again and again. It is an elusive, arrogant, intellectual language. Language that alienates and discriminates. Partisan, anti-democratic language. Poetry is the soft language of a tiny voice, spoken by a negligible minority. No one gets rich from poetry. Not the poet, not the designer, not the printer, the editor, the publisher or the distributor, not the bookseller or the festival organiser. Poetry evades all laws of economics, all social codes. Poetry is elusive, and in its elusiveness it fuels your doubts and increases your ability to fail. Poetry is arguably the most precise language when you falter. And the most unstable language when you are fully conscious. When poetry pulls you into unaccountable visions and the darkness of night thoughts, it is the torpedo from the depths, the inventory of our confusion and our shortcomings, of our resistance to perfection. It is the language that seduces us and overwhelms us when we think we‘ve mastered it, shakes us awake when we think we must rest and convinces us that we are wrong at the moment of our conviction. It is poetry that offersus possible words when something momentous happens to us.It offers a complexity that is consoling. Poetry is more than the words it speaks. It is, as the poets in this collection express, more than speech without sound, more than words that don’t sleep. It is the power of words, the mastery of the original thought, delicate and elusive, bobbing at the height of the bushes.It is the visible side that announces the colour, a virgin’s scream in the rainbow; it is a beauty worth protecting, cheek to cheek. It is the literal potential of things, a mimicry of migrating birds, the union of foliage and sun, a contract with the clouds.It is everything that becomes visible during defrosting,and the truth we forget because of remembering. Poetry is, as the Dutch Poet LaureateAnne Vegter recently said, the stool we climb onto when we want to peek into other realities. Poetry is able to bringcountries like Holland and India cheek-to-cheek. What poetry is, it is in itself. ‘That which cannot be conceived through anything else must be conceived through itself,’Spinoza once said. Or, poetry isn’t about something, it is something. Poetry, ladies and gentlemen, is happiness. KRITYA International Poetry Festival 2017 is the 11th such festival organized by KRITYA Literary Trust. In 2017 we are collaborating with RAZA Foundation, New Delhi and Bharat Bhavan, Trivandrum. The theme for 11th KRITYA Poetry Festival will be “Poetry against racism and xenophobia”. This is a highly relevant theme in today’s world, as hatred and crimes against minorities of all kind based on their faith, race, gender, languages; cultural traits have maligned the life on earth as never before. As we invite around twenty international poets with great stature (participating through the grants given by the ministry of culture of their respective governments) and twenty poets from within the country, KRITYA will be taking them to schools and colleges, to organized poetry meets, We will also take poetry to Hospitals, Prison, Old Age Homes and Orphanages with due permissions and sponsorship from authorities and enlighten the imagination of the audience with peep into world outside. We will use translations of the works in local languages to communicate with local community. We will also organize poetry painting exhibitions, and poetry film presentations in different views. Thus KRITYA would try to connect people to poetry and to its emotive aspects. goodbye, moon knocks on the door. we don’t need snow to have a white Christmas.